Of the senators running for reelection in 2018 in potentially competitive races, Amy Klobuchar is at the head of the class in popularity. Robert Menendez? Not so much. A new batch of senatorial approval ratios from Morning Consult is out, from polls taken between October and the end of 2017. The big trend is that politically vulnerable senators up for reelection in 2018, many of whom are being softened up with attack ads, are losing some ground, though many are still in relatively good shape. For this particular election cycle, “vulnerable” mostly means Democrats, particularly the ten running for reelection in states carried by Donald Trump in 2016. The data show declines in net approval ratings [during 2017] for nine of the 10 Democratic incumbents who are running in states President Donald Trump won in 2016, and who have faced attacks on the airwaves and online from their Republican challengers, the National Republican Senatorial Committee and outside conservative groups. But of the Trump Ten, none are actually “underwater” in approval ratios, though two — Tammy Baldwin of Wisconsin (40/40) and Claire McCaskill of Missouri (41/41) — are dead even. Three (Heidi Heitkamp of North Dakota, Bill Nelson of Florida, and Joe Manchin of West Virginia) have approval ratings at or above 50 percent and relatively low disapproval ratings. And several others have net positive approval ratios in double digits (Sherrod Brown at 46/28; Joe Donnelly at 44/30; and Bob Casey at 43/32), and two others are close to that (Debbie Stabenow at 44/35 and Jon Tester at 57/40). All in all, the Trump Ten are hanging in there, particularly if they benefit from a late Democratic “wave” or from nasty GOP primaries to choose challengers. And there’s one Republican incumbent, Dean Heller of Nevada, who’s not doing all that well at 41/39. The star of the cycle is probably Amy Klobuchar, who, despite being from a competitive 2016 state, has an approval ratio of 59/24 and no prominent GOP opponent as of now. And the problem child is easy to identify, too: Robert Menendez of New Jersey, whose approval ratio is a dreadful 29/45, and that was from polling before the announcement that he will be retried for corruption in federal court (a mistrial was declared in his earlier trial in November). 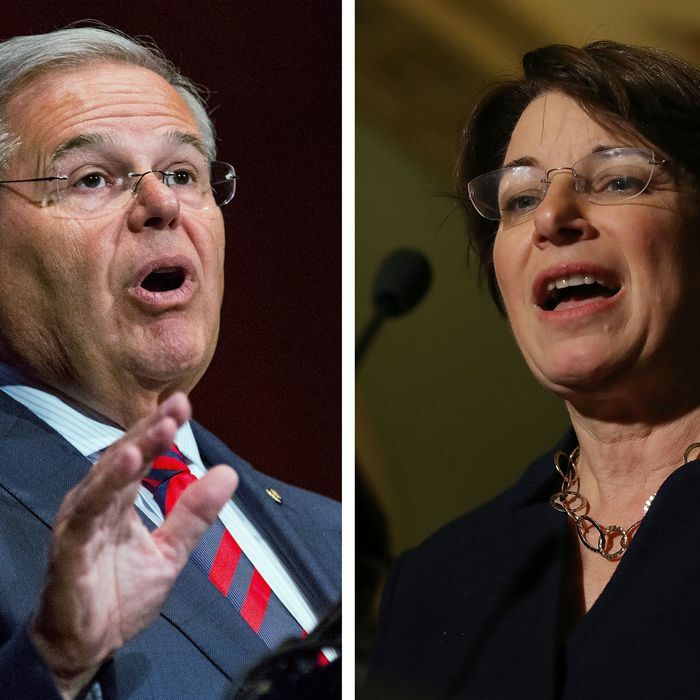 Menendez is obviously lucky to be running in a solidly blue state, but the fact that he’s the least popular senator in the country is likely to attract a credible opponent sooner rather than later. But he can draw some comfort from the fact that his partner in unpopularity in the Senate is none other than Mitch McConnell, whose approval ratio back home is 32/53. Persistent meh-to-terrible numbers in Kentucky haven’t kept McConnell from getting reelected and wielding great power. Sometimes money and luck can go a very long way.